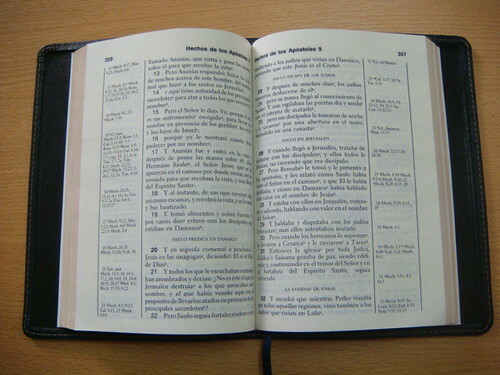 Spanish New Testament "La Biblia de las Americas"
I ordered the rebinding of this New Testament when my wife and I were living in Mexico. 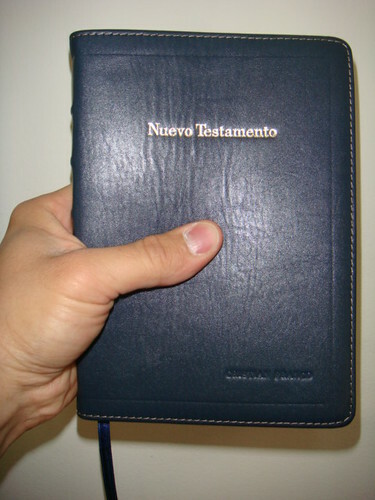 (I serve the Lord in the Luis Palau Team, and now live here in Argentina). 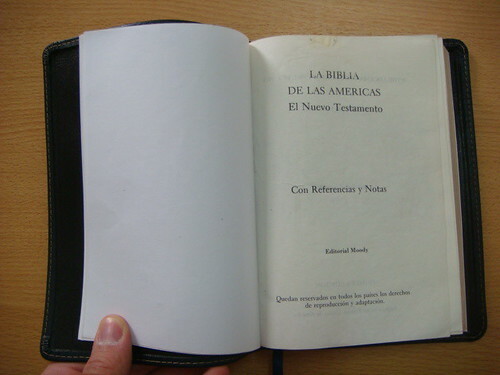 The text is "La Biblia de las Américas", a very special and literal translation made by Lockman Foundation (creators of the NASB translation). I found two copies of this edition (printed in the 70's) at Amazon and I bought them. 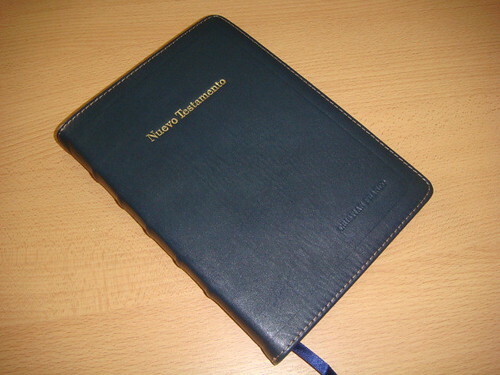 Then, I sent one of them to Abba Bibles to be rebound. And I ordered it in blue, my favourite color! 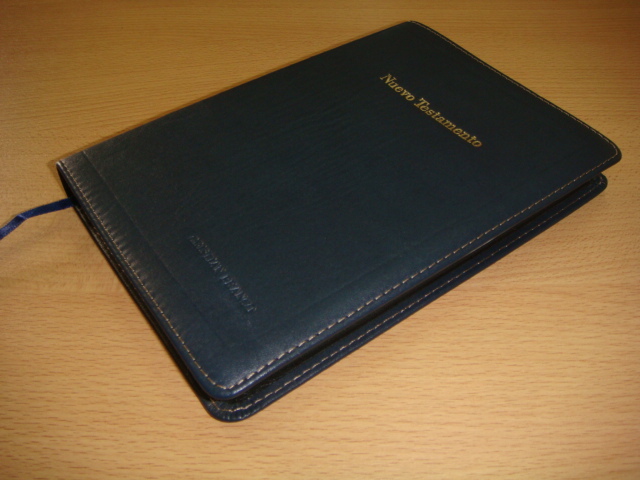 This edition is bound in blue calfskin with leather linings, gold page edges, and one ribbon marker. My name is embossed on the cover. Above: The blueness of the leather comes through loud and clear in these photos. 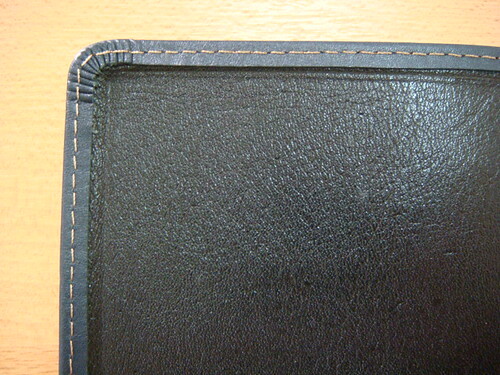 I'm quite fond of the contrasting stitch around the edge. 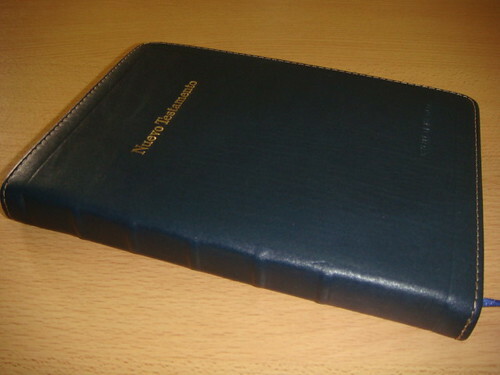 Above: Note how the cover wraps around the corner of the page. "Semi-yapp" is interpreted in various ways, some edges more curved than others, but what such covers should have in common is that they embrace the text block in clamshell fashion. Above: The page spread. Notice how much distance there is between the page edge and the cover? My guess is that this started off as a glued edition. The layout is interesting, don't you think? A narrow text column and generous margin for references. 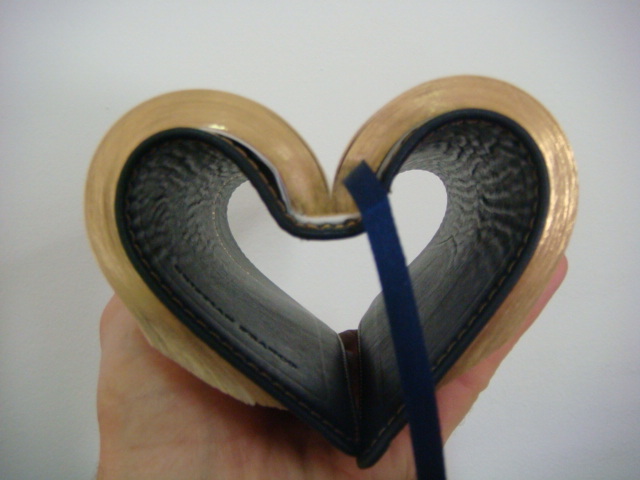 Above: Again, this reminds me of the inside cover of my Crossway Cordovan Calfskin ESVs. I love the clean edge, the leather lining, and the contrasting stitches. Above: Now this is interesting. 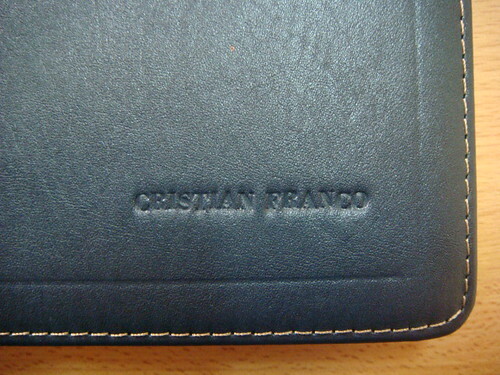 Cristian's name is embossed on the cover, but there's no gold gilt applied. Putting names on the cover like this is an old tradition, but one I haven't really indulged in. (I sometimes think I'd be happiest with no imprinting at all, on the front of the spine.) If you're going to do it, I like the subtlety of this approach. 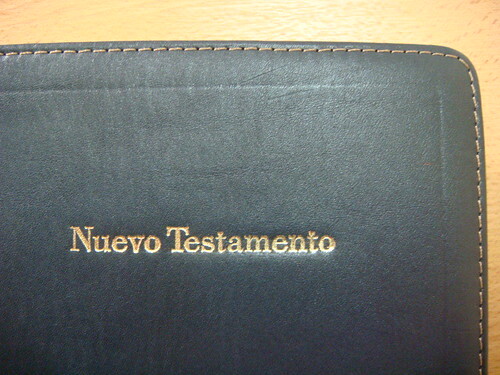 Above: Close-up of the imprinting: Nuevo Testamento. Above: Very clean. I like the bare spine. What can I say? I'm a minimalist.